Emily Fischer's handmade quilts cover the emotional bases for lovers of these coastal New England places. The beach where you got married. Your family's beloved vacation spot. The island you call home. Emily Fischer's hand-stitched quilts cover all the emotional bases for those who love Cape Cod, Martha's Vineyard, and Penobscot Bay. 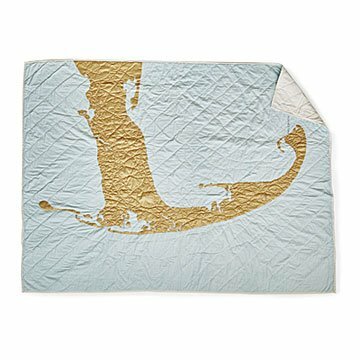 Gold "land forms" are appliquéd onto a light blue quilted ocean, with embroidered, map-inspired details. Wrap one around you and dream of the windswept beaches, glorious dunes, and blinking lighthouses that have a grip on your heart (no wonder—it's 73% water itself). Beautiful enough to hang on the wall as art. Machine washable. Designed in Brooklyn. Handmade in India. Note: Because the Penobscot Bay coast is so complex, its quilt requires many more hours of intricate stitching than the other two. It's also larger. Machine wash cold on a gentle cycle, tumble dry at the lowest setting. Due to the handmade nature of the quilts the sizes will vary slightly from quilt to quilt.